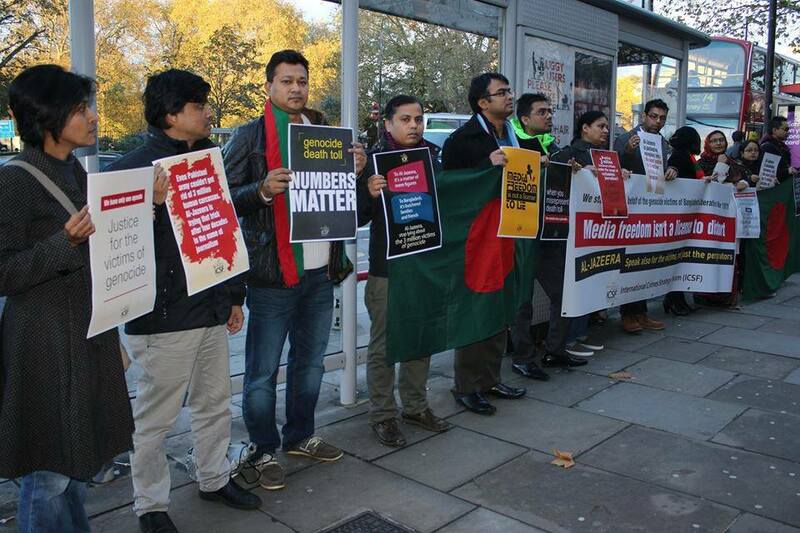 It has been noted that Al-Jazeera has persistently distorted national history and presented biased views since the justice process in Bangladesh International Crimes Tribunal (ICT) has commenced. The protesters demanded accountability, journalistic objectivity, neutrality and conscientiousness from the news agency in covering issues that are sensitive to the victims, such as, the trial of the perpetrators and the factual details pertaining to the history of 1971. The organisations that took part in the protest are: Ekatturer Ghadak Dalal Nirmul Committee, Projonmo 71, Rising Path for War Heroine, Saudha, Campaign for Protection of Religious Minorities in Bangladesh (CPRM), Bangladesh Community Church, Nari Chetona, British Bangladesh Women’s Organisation, Dockland Theatre and Performing Arts, Communist Party of Bangladesh (CPB), Bangladesh Jubo Union, Awami Ainjibi Parishad, London City Jubo League, UK Mohila Awami League, JSD, ICT Support Forum, UK Awami League.